'Joyce Terry' (Tell Muhlestein, R. 1974). Seedling# 493 A. TB, 38" (97 cm). Late midseason bloom. Standards yellow; falls white, edged yellow; yellow beard. 'Charmaine' X 'Launching Pad'. Tell 1974. From AIS Bulletin #213 April 1974 Introducing JOYCE TERRY (Muhlestein '74). Midseason-Late, 38". Charmaine X Launching Pad. Named for my talented sister-in-law. This is not a new color combination, having yellow-domed standards, flaring white falls with exact yellow border. The cleanest and best contrast I have seen in this color class. Lots of charm and personality. Vigorous rhizomes and foliage. #493 A. $35.00. Tell's Iris Gardens. jpg 20170601_124504TB Joyce Terry (2RS).jpg manage 260 K 15 Sep 2017 - 03:23 HollyJohnson2017-04-01 Two stalks of TB Joyce Terry. Photo taken by Holly Johnson at the Minnesota Landscape Arboretum, zone 4b, on 6/01/2017. jpg 20170601_124514TB Joyce Terry (2RS).jpg manage 203 K 15 Sep 2017 - 03:26 HollyJohnson2017-04-01 TB Joyce Terry. Photo taken by Holly Johnson at the Minnesota Landscape Arboretum, zone 4b, on 6/01/2017. 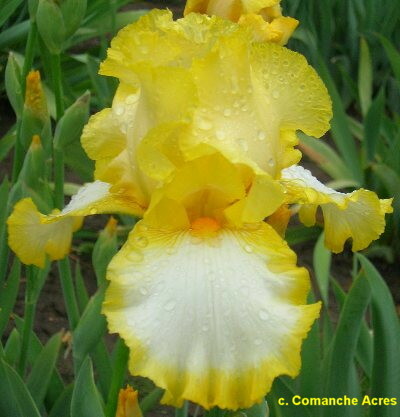 jpg JoyceTerry1.jpg manage 102 K 17 Oct 2018 - 19:48 Main.TLaurin Photo by Lori Rhodes-Crafton Hills Iris Farm. JPG JoyceTerrySI.JPG manage 225 K 16 Apr 2019 - 22:01 Main.TLaurin Photo by Sandy Ives. jpg P1370113-X2_joyce_terry.jpg manage 201 K 17 Feb 2016 - 11:05 BrockHeilman Please contact Brock Heilman for image use.